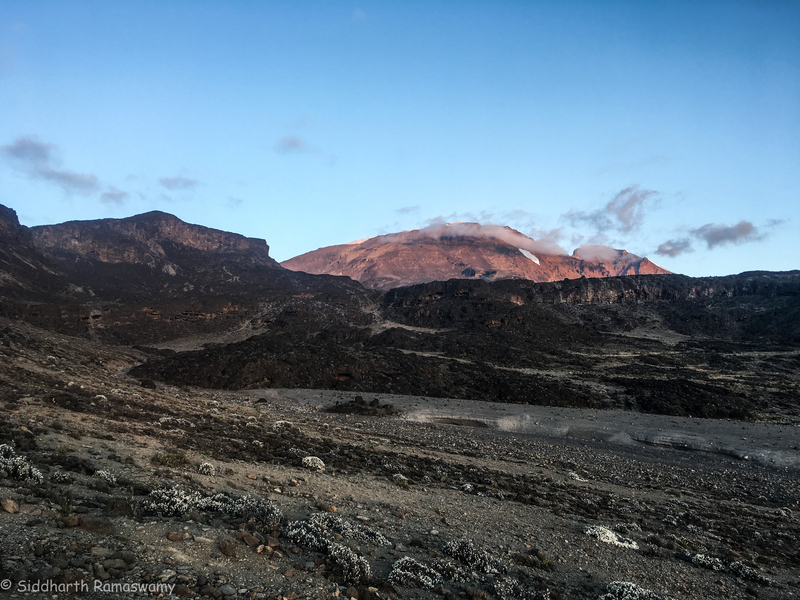 Stella Point, Mount Kilimanjaro, October 1st 2017, 6:37 am. Tears of joy welled up in my eyes as I hugged my guide, Sherapin. Many thoughts came rushing into my mind. I missed two people, my late mother-in-law and my late father. I wished I could share my experience with them. In 2006, 15 minutes into a football game, I was physically exhausted. I realised I was physically unfit. In a casual conversation with a friend I vowed to improve my physical fitness and climb Kilimanjaro. 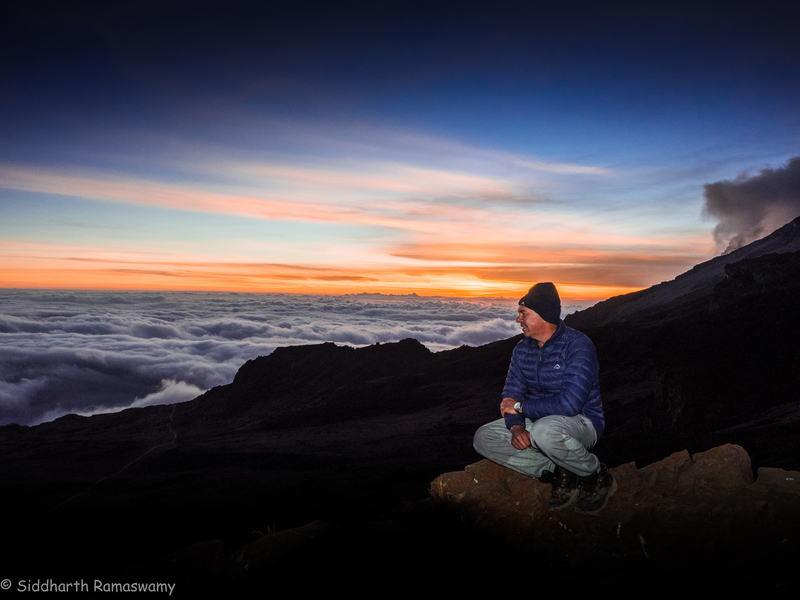 Get back my physical fitness I did, but the idea to climb Kili faded away. It re-surfaced when we moved to Kenya in 2013. Now I needed the right group of people to climb the mountain with. In 2016, a mention of this dream in a school WhatsApp group evoked a lot of interest. 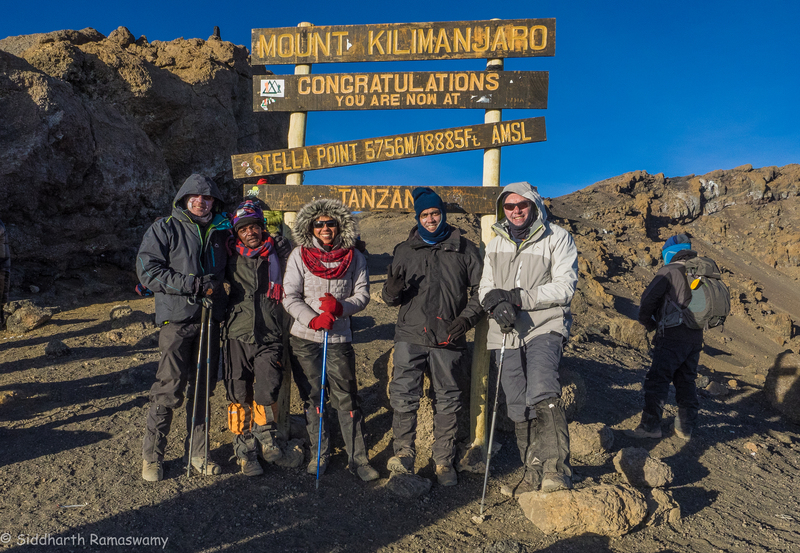 Eight people from the group wanted to sign-up for the climb – some friends and their spouses. As I spoke about my plans to colleagues and family, two more people signed up. 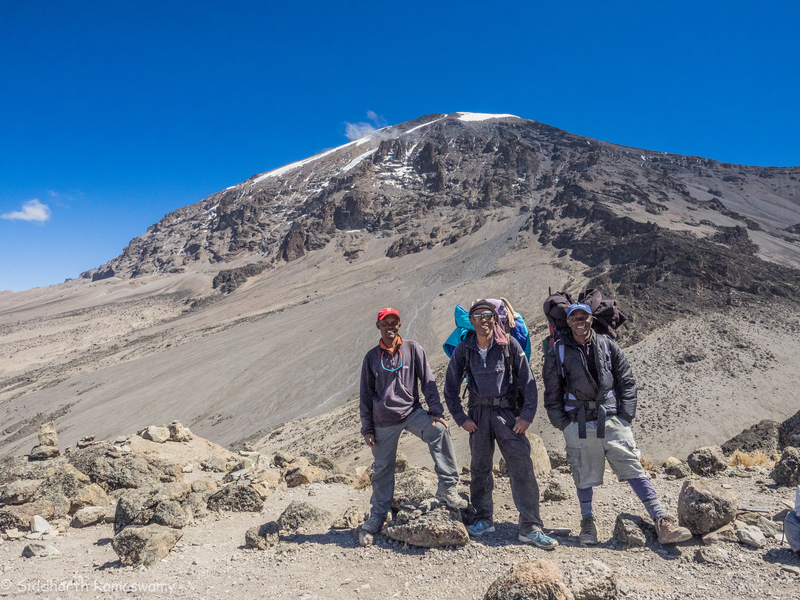 The ten of us set up a Whats App group, Climb Kili. The introductions happened and conversations began. 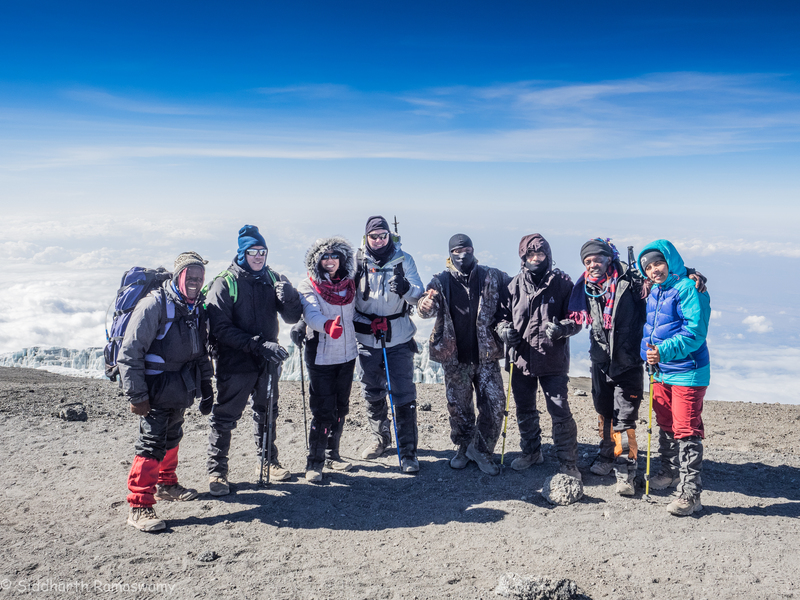 Dates were finalised and the company to climb with was chosen – “Climb Kili“. Who else!?! This company was suggested by one of the people in the group and also by my sister-in-law, Rekha, who climbed with them in 2015. However, as happens with most large groups, work, personal circumstances, etc. led four people to drop out. The next decision to be taken was about the duration of the climb. I asked a few people and read up experiences of others on the net. 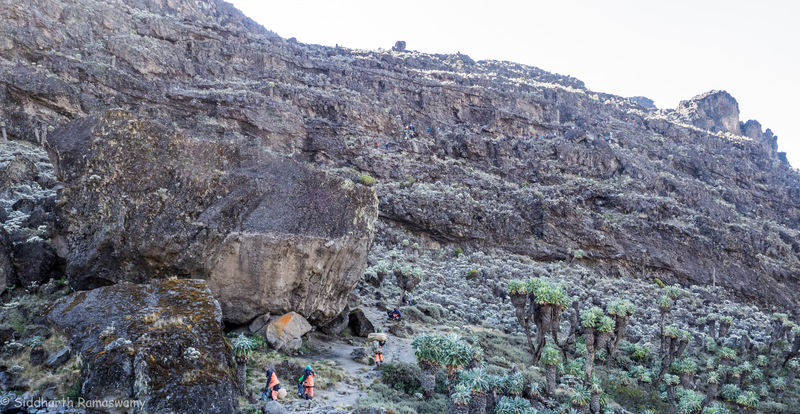 I found that the eight day climb along the Lemosho route would give us the maximum chance of success – 80 to 90%. The shortest duration was 5 days, with a success rate of around 65%. The additional 3 days seemed well worth it. 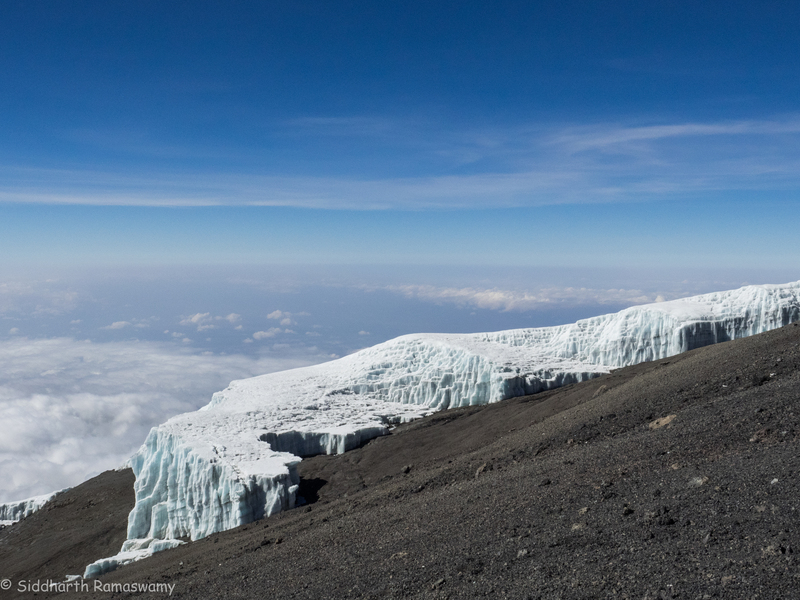 We registered with Climb Kili and made the advance payment. I was very excited. From all reports, the key to success was physical fitness and the body’s reaction to altitude. The latter, I would know only as I climbed. Hence, I focused on the former. Based on my research and the guide to fitness sent by Climb Kili, I drew up a plan and engaged a trainer. I had to combine cardio training with climbing and strengthening my core muscles. The start of the training was tough, even though I had been running regularly for more than a decade. Next on my check list and a really interesting part of the preparation was acquiring the gear. The list was very confusing and I had to familiarise myself with the terminology. The various web sites gave brand names I had never heard of. I finally decided to make it easier and shop for everything from my bag to my boots at Cape Union Mart in South Africa. I felt like a little boy going on a camping trip and bought everything that was suggested by the helpful staff. I was allowed one 80L duffle bag and a backpack for the trip. My wife, Swati, who enthusiastically accompanied me for the shopping, and I filled up the bag in the shop to make sure that everything fitted and that the bag was within the weight limit of 15kg. The few things that I did not find at Cape Union Mart, viz. a backpack with a water bladder, hiking poles, sleeping mattress, gaiters, etc., I bought in Decathlon India. Finally the date of travel arrived. We were finally a group, physically together. Wayne Hackart: My close friend and colleague. Venkatesh Iyengar: My bother-in-law and a doctor with experience in high altitude medicine. Pratibha Nware & Media Nadir: My classmates from school. 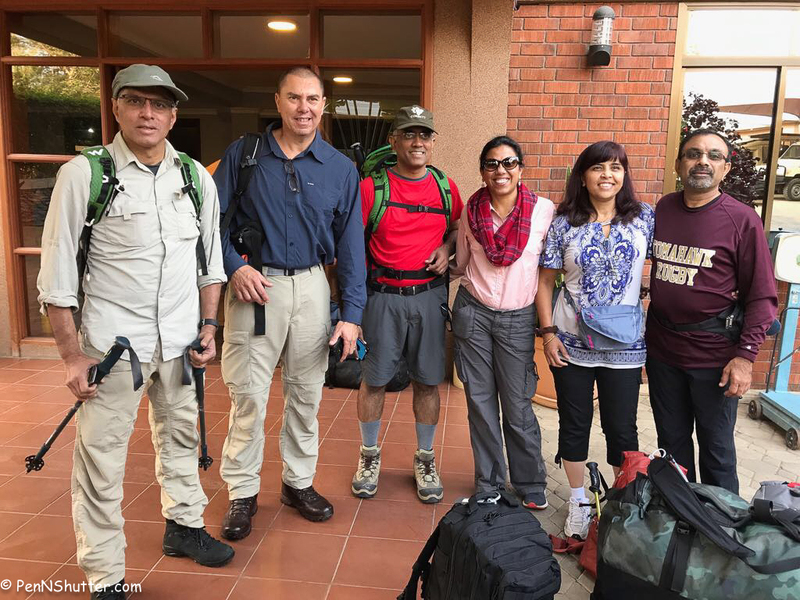 Venkatesh was the first to arrive in Arusha, Tanzania on September 23rd. The rest of us joined him the next day. Kilimanjaro airport is small and quaint but the immigration process is very quick and efficient. 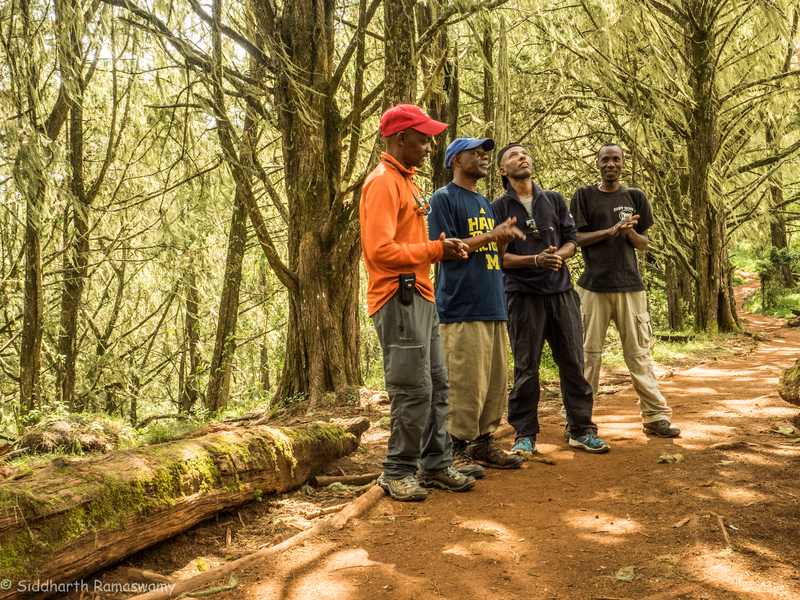 Wayne and I traveled together from Nairobi and we were welcomed by a member from Climb Kili who took us to our hotel. We had to weigh our bags as we were not allowed a gram above 15kg. I had taken care of the weight while buying and packing my bags at home. I had no problem. 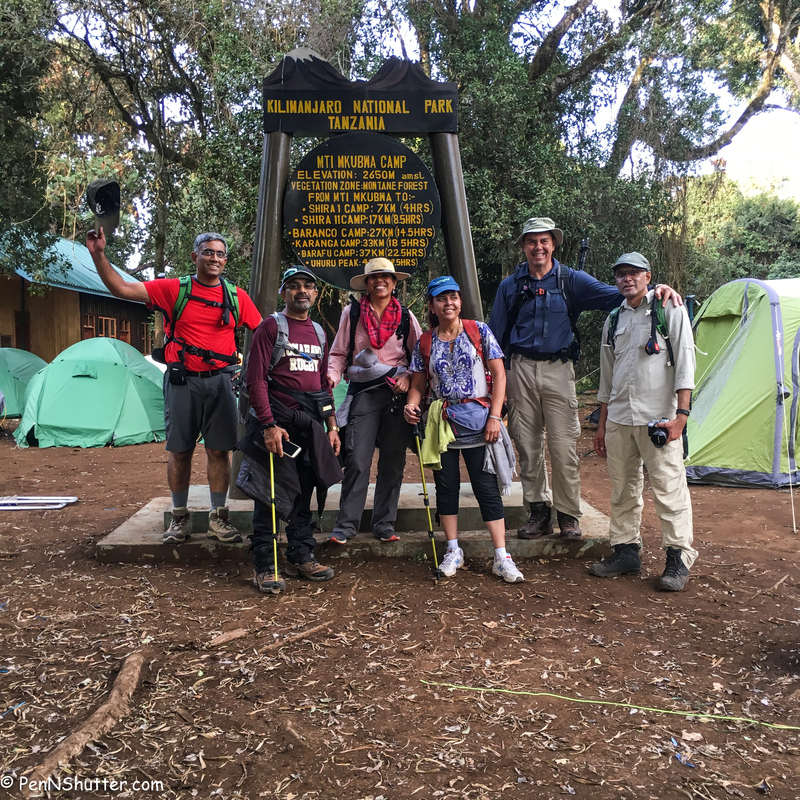 Day 1: Arusha to Mkubwa camp. Lazy bones and late night on day zero meant we started late for our 3 hour drive from Arusha and arrived at Londorosi gate at 11:30 am. I expected to see only a few people, but there were at least 50 – 60 people climbing the same route. After signing in, we had our first lunch cooked by Master Chef “Machapati”. Carrot soup, bread, eggs, potatoes and chicken for the meat eaters with banana for dessert. After lunch we started our climb. From every thing that I was told and I had read, I expected a gradual climb to begin with and a tough climb on the final day. But no, it was quite a steep climb from the start. 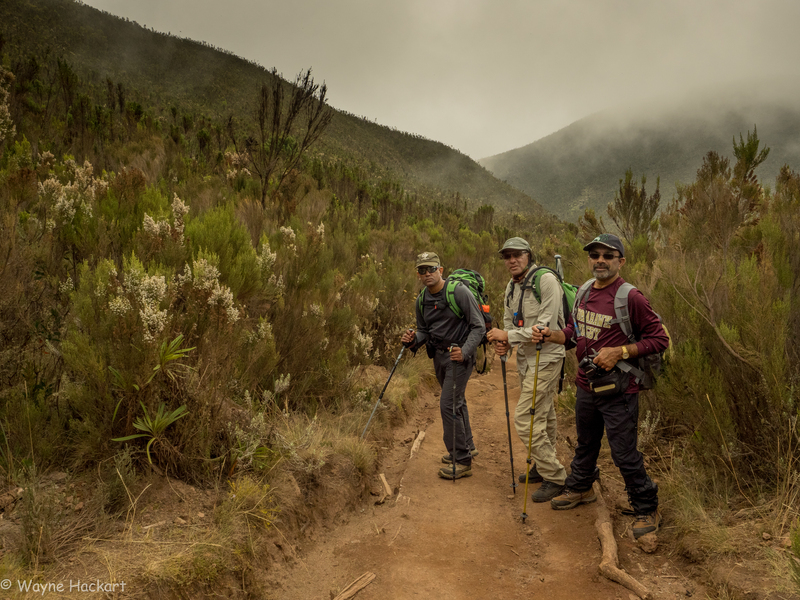 The instructions from the guides was quite simple: Pole, pole (slow, slow) and drink a lot of Kilimanjaro whiskey (good old water). The porters put us to shame. Our 15kg bag on their heads and their own large bags on their backs, they breezed past us. From the start Wayne took on the task of reminding us every 15 minutes to take a sip of water. The routine was set. A guide at the front set our pace and a guide at the rear monitored our progress. They would switch positions every day. The guide at the rear the previous day, would lead the next day setting the pace of the group based on his assessment. This was a routine they followed through the climb. The hike was through a lush green virgin rain forest with tall trees and lichen all over. 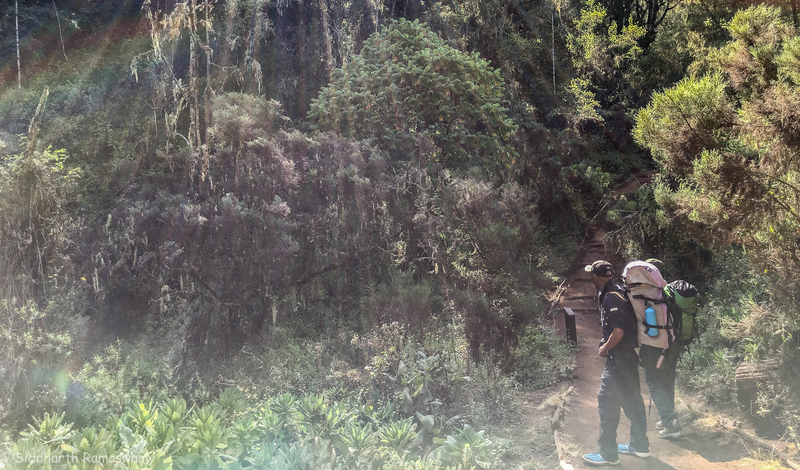 The air was fresh, we heard birds chirping and saw Colobus monkeys. What mankind has robbed itself of in the name of progress and civilisation. 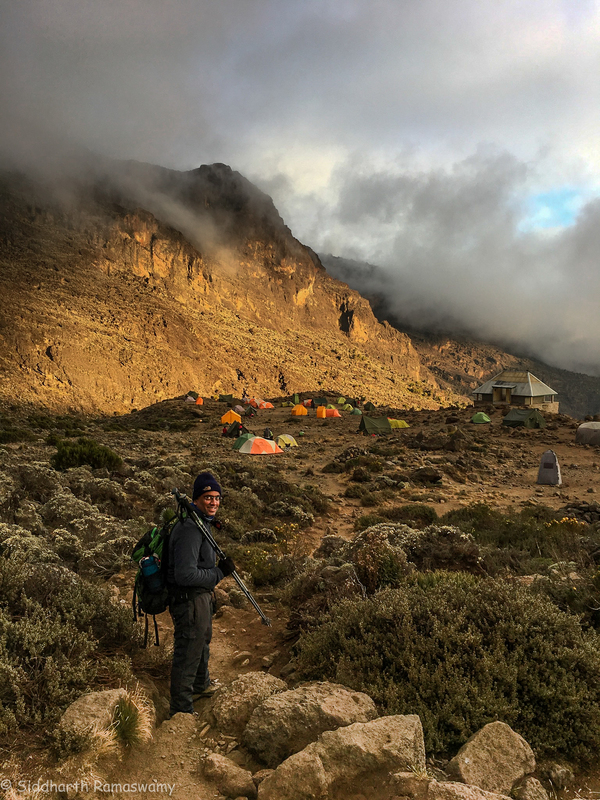 After a 3 hour trek we arrive at Mkubwa (Big Tree) camp at a height of 2650m, named for the big tree around which the tents were pitched. I felt a sense of achievement and excitement. We had started the actual climb. We were served hot tea and popcorn. I was told that popcorn is good for digestion as it has a lot of fibre. One learns. Dinner was delicious. Coriander and lime soup, pasta and vegetable sauce. Banana for dessert. Another routine was established. Thereafter it was soup, carbohydrates, vegetable and some protein for every meal. The sleeping arrangements were two to a tent. The sleeping bags were placed next to each other and our bags were kept against the tent walls. This was done to prevent the sleeping bags from getting wet due to condensation on the walls of the tent. The size of the tents was just enough for two people. This helped keep the air warm with our body heat. Day 2: Mkwaba camp to Shira 1 camp. After a couple of hours of trekking our guides decided we needed a break. Yes, we needed and took one while they broke into a melodious chorus. After the performance they told us that we would shortly be getting out of the rain forest. we stopped for lunch – coriander soup, omelette , pasta with potato and carrots and pineapple – served in a quickly erected mess tent. After lunch we hauled ourselves up for a steep climb. The terrain was rocky and the climb tougher than the first day. But that was now expected. 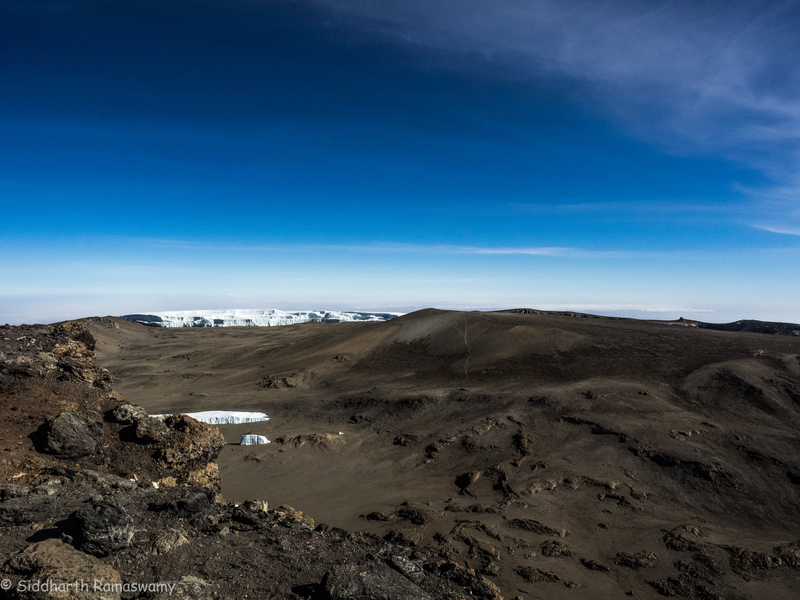 Finally, at around 4:00 pm we sighted Shira 1 camp (3500m) at a distance. It was a relief to my tired legs and brought in a fresh burst of energy. As we made our way on now flat ground, the clouds moved and gave us a glimpse of the mighty peak. Kili looked much nearer. At the camp the staff welcomed us with a song and dance. The warmth of our staff was one of the highlights of the climb. 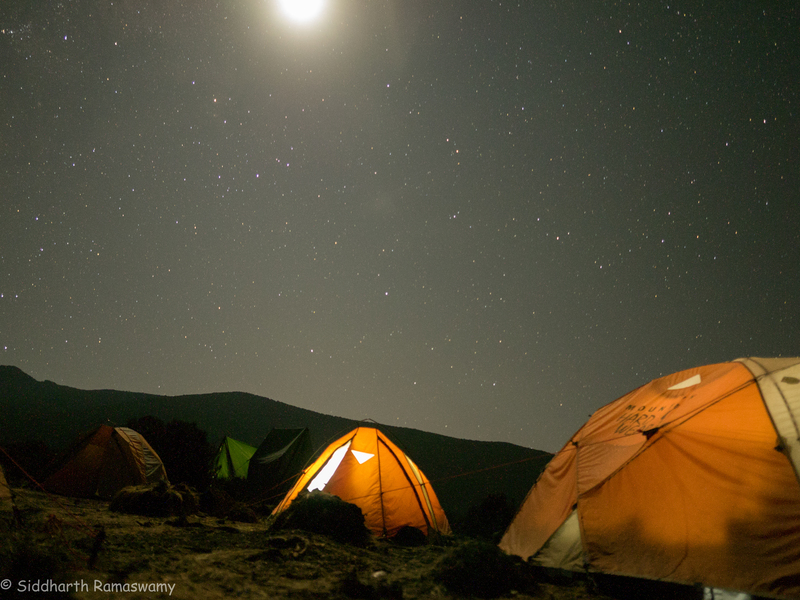 As we settled down for dinner, the moonlit camp and the stars above us were a beautiful sight. Day 3: Shira 1 camp to Moir hut. The guide told us it was going to be an easy trek to Moir hut. 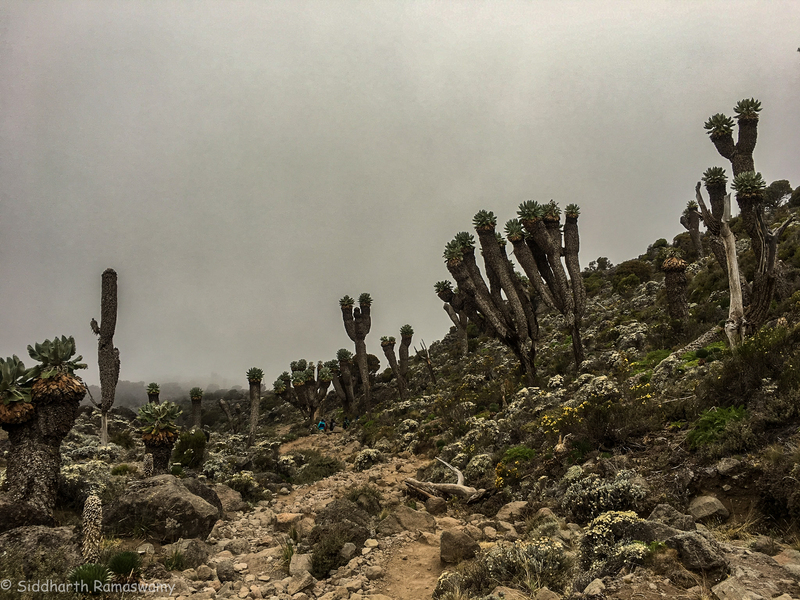 The terrain was even with a gradual incline, giving us time to catch up on each other’s lives. 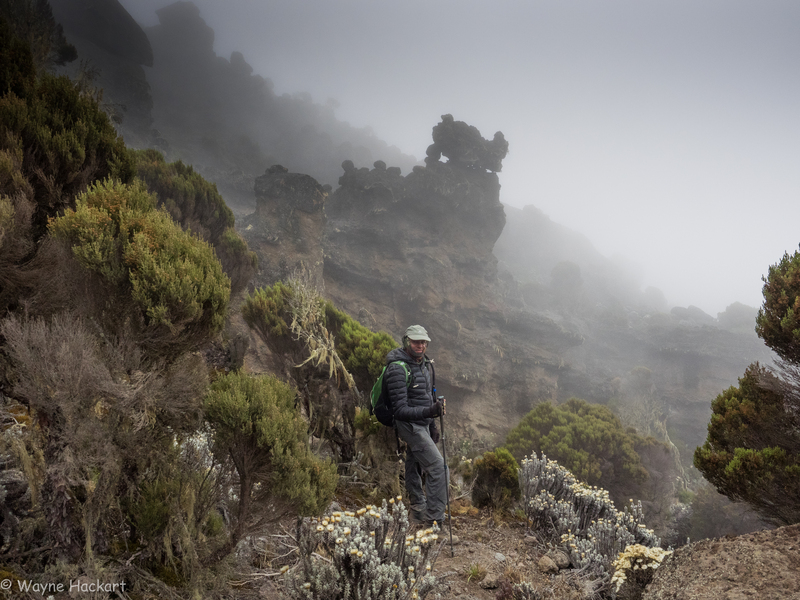 Then, an hour before lunch the clouds moved in, the landscape became rocky and the climb steep and tough. The scenery and the atmosphere were incredible. After lunch we continued our hike. We went past some amazing cave and rock formations. Finally we reached Moir Hut (3400 m) at around 4:00 pm.We were welcomed with a dance by our support team. As we put our bags down our guide wanted to know if we were up to going for a “short climb” upto 4200 m! If we were lucky we could get some phone signal to call home. Four of us joined him. We climbed for 45min over a steep rocky terrain. As the clouds cleared the sight of the peak was breathtaking. And it seemed nearer. It was also my first sight of an alpine desert. We managed to speak briefly to our families. It was freezing and we needed to get back to camp for the warm soup. The day was bright and sunny. Every one was in high spirits. The exhaustion of the previous day was gone. This was going to be our first test of altitude. 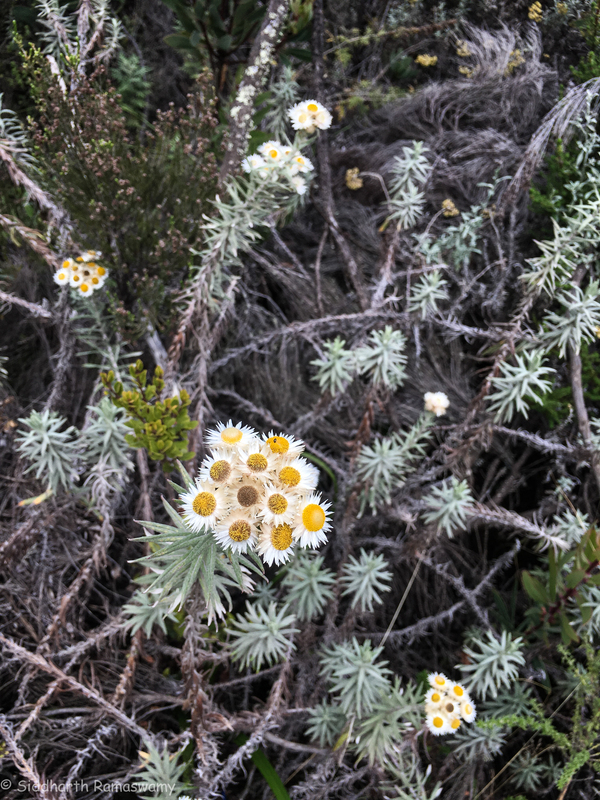 It was an easy enjoyable climb through shrubs followed by alpine desert. 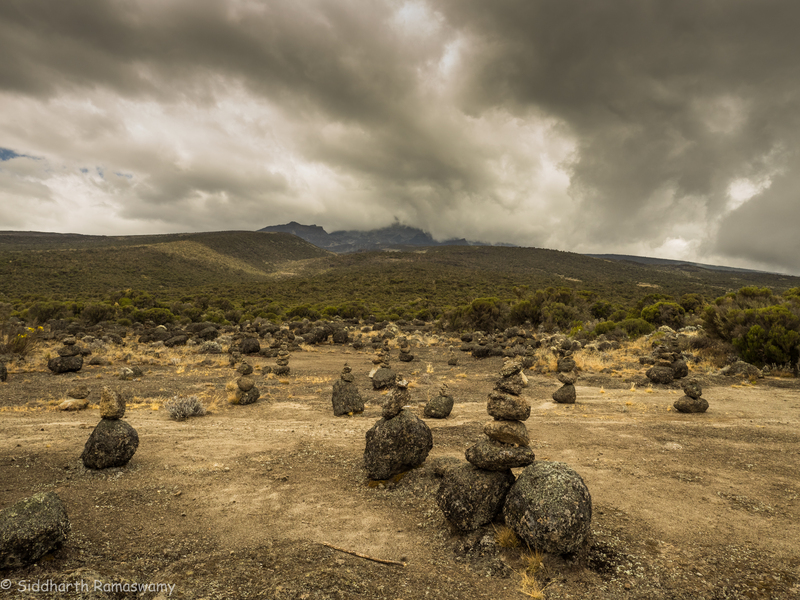 The land was dotted with boulders thrown up by the volcano and desert shrubs. The pattern looked as through some one had placed them to a plan. It was beautiful. 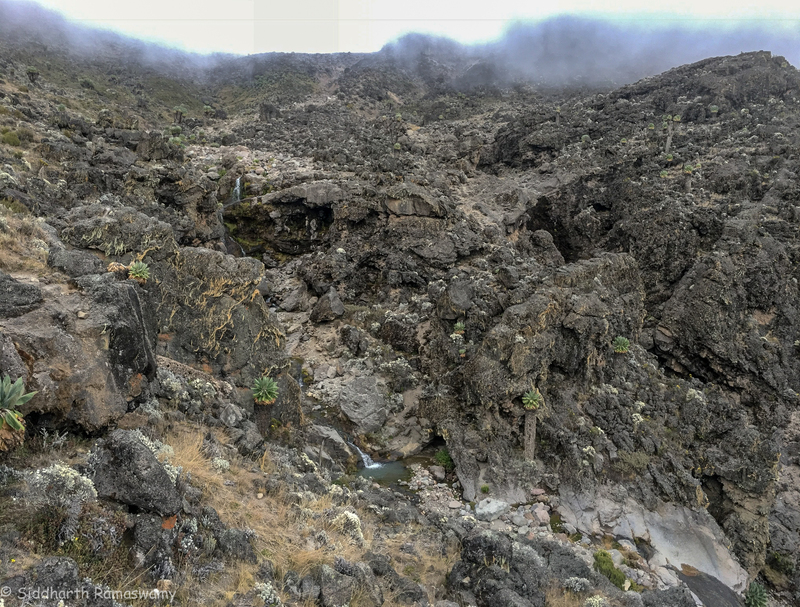 After about 2 hours we came across the lava flows. Frozen in time for millions of years, it made me wonder what it would have looked like when the volcano was active and the red hot lava was flowing. It was then that three of us had our first experience of altitude sickness. At around 4500 m we had severe nausea and headache. We pushed ourselves to reach the mess tent and collapsed in our chairs. We were at the Lava tower (4600m). Though I struggled through the lunch, the vegetable pies and soup was delicious. It amazed me how Machapati made such delicious and elaborate meals with such meagre resources and at that altitude. Our guides decided that we needed to get down to a lower level fast. The climb down was steep and treacherous. I felt like a little boy jumping from one rock to another. 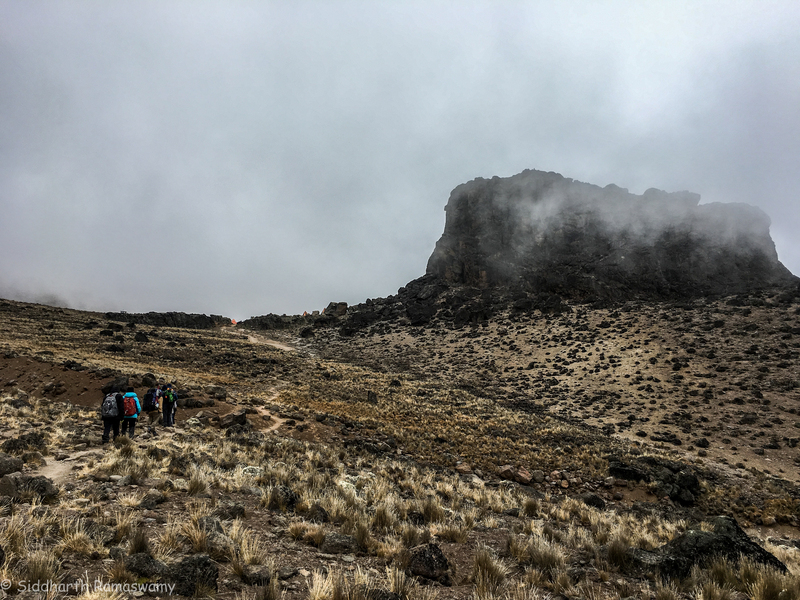 As we descended to a plateau, the nausea eased and the headache reduced. 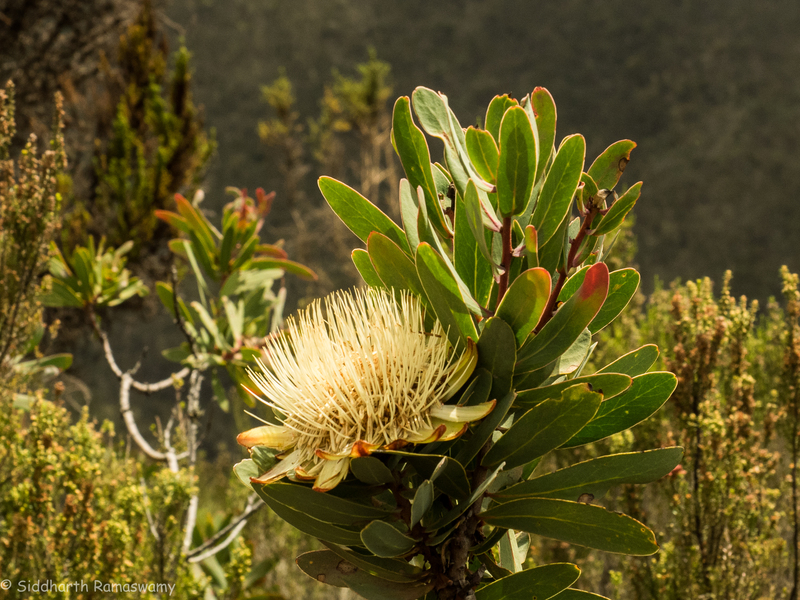 The flora and the scenery was breathtaking. I could have just stayed there for eternity. We arrived at Baranco camp (3900m) at around 5:00 pm. Venkatesh and Seraphin checked everybody’s vital measurements – pulse rate and oxygen levels in the blood. They tweaked the medication for those who were not feeling well. 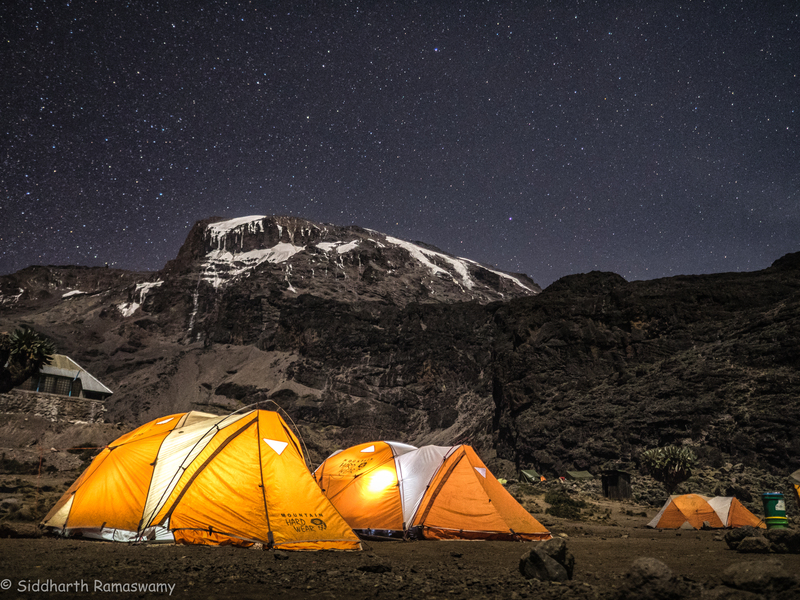 As the moon rose, the sight of the Kili peak bathed by the moonlight was incredible. It was freezing cold and I wanted to crawl into my sleeping bag after dinner. But Venkatesh pushed me to take a photograph that I had been wanting to. The daunting Baranco wall was ahead of us. As I saw the line of climbers and porters ahead on the vertical face of the wall, my heart sank. Could I do that? Sherapin encouraged me. It was a wonderful climb and an experience I would recommend, though not for the faint hearted. Just as I thought I was getting good at it, came “Kissi rock”. 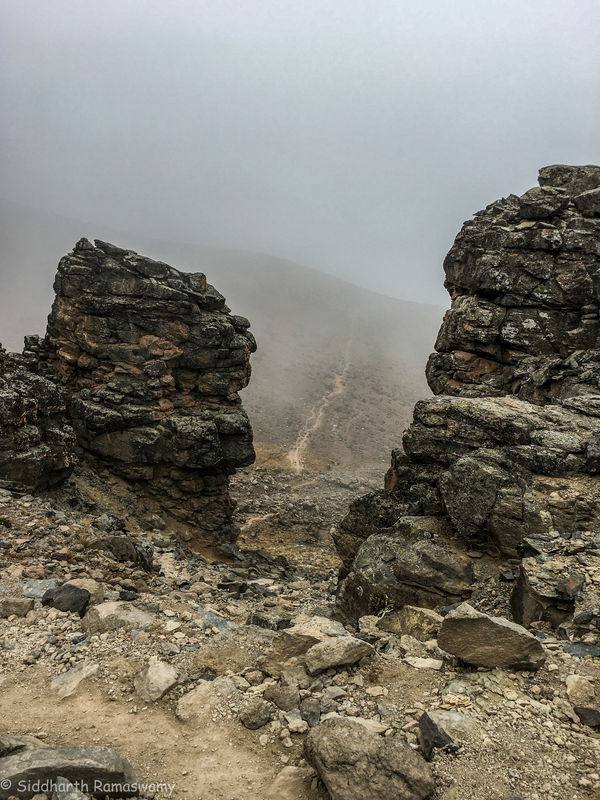 It is a narrow path around a huge boulder with a sheer drop on the other side. 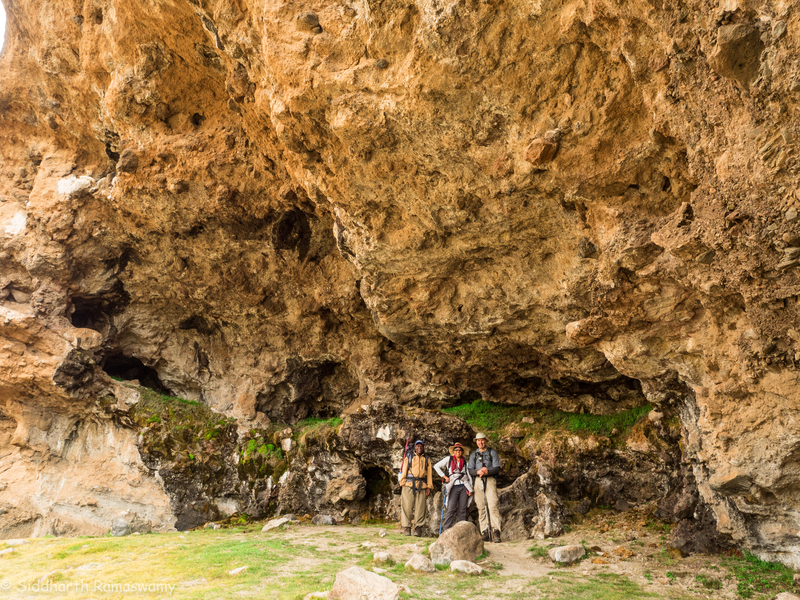 Paul, our guide, stood with his arms out stretched between us and the fall, creating a human barricade. We kissed the boulder as we squeezed through. 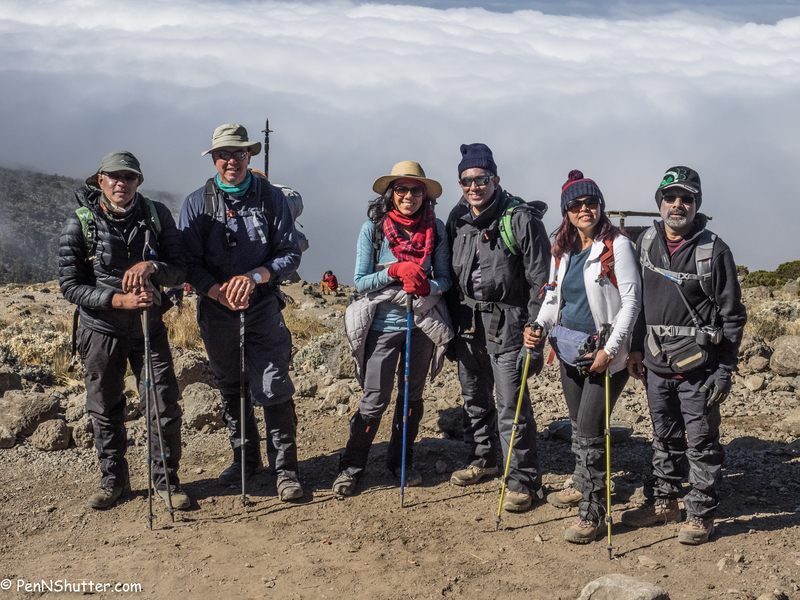 it was a gradual climb down and up again to Katanga camp (3900m). The landscape and the vegetation were captivating. Mist added to the sense of mystery. 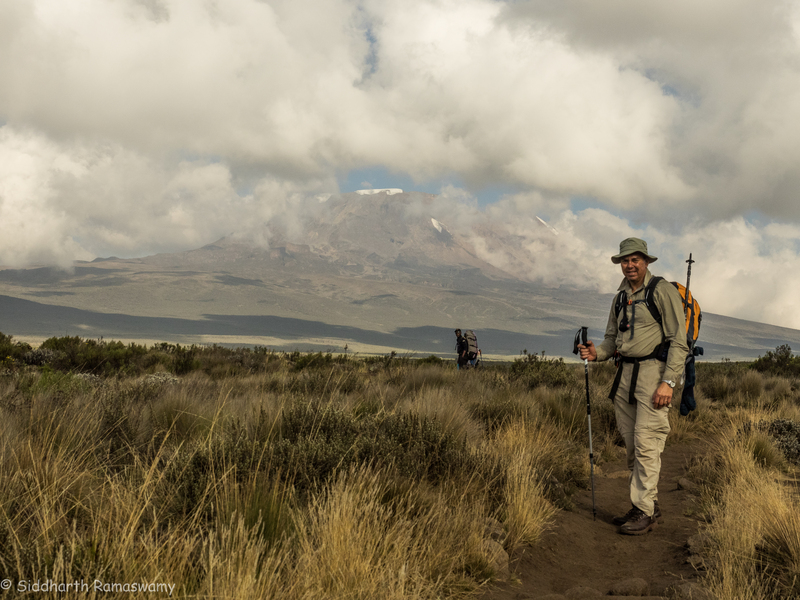 As we crossed the Karanga river, we saw porters fetching water and climbing up to the camp. This river is the last source of fresh water for the climbers. 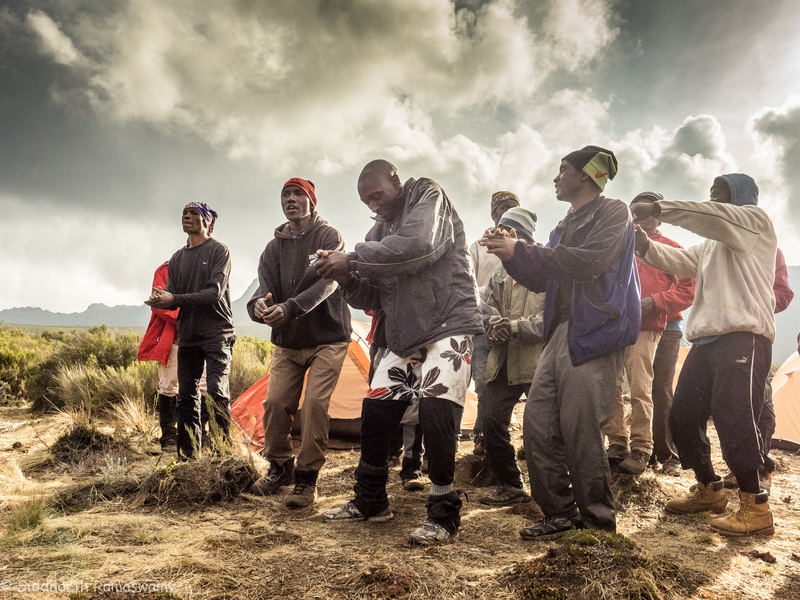 From here to Karanga camp and onwards to Barafu camp, a trek of about 4 hours, the porters carry 15 litres a trip. 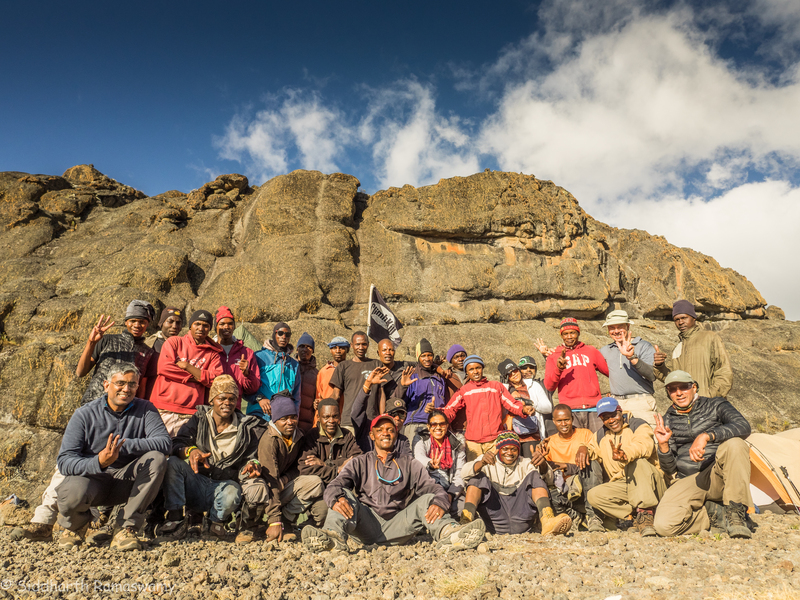 It humbled me to see the commitment and the hard work of these people, just so that we could climb up to the summit. 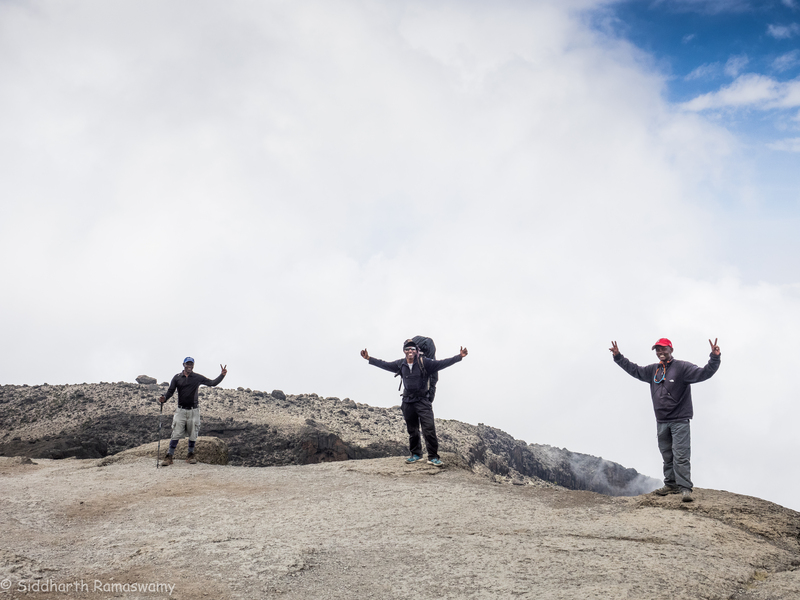 By now we had recovered from our altitude sickness completely and every one felt great. After dinner, we went through our daily medical check. This had turned into a competitive game, who was the fittest? As the sun rose, we found ourselves above the cloud line. This was now the day! 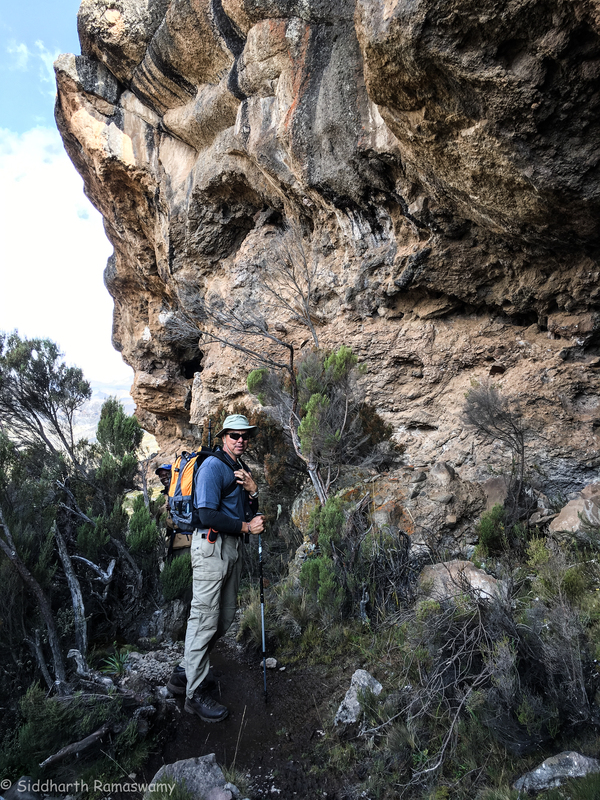 It was a short and easy climb before lunch to Barafu camp (5000m). The peak gave us a very inviting view all along the climb. At 5000m breathing was difficult for a little while. After lunch we were advised to rest before our overnight climb to the peak. But with the excitement, it was difficult. We had an early dinner. Once again, the day was ending with an beautiful sunset. We were woken at 10:00 pm and we had some tea, hot chocolate, biscuits and popcorn. Fully geared up with layers of clothes, headlamps on, we started the climb at 11:00 pm: pole pole. Over rocks, gravel, steep inclines. Cold breeze caressing our face and welcoming us into the arms of the peak. It was four nights to full-moon. The moonlight made the adventure even more exciting.Wanting to experience this natural beauty, I switched off my head lamp. As we climbed, the air got thinner and breathing more difficult. We rested every few minutes. After a few hours, I had crossed the boundary of physical exhaustion. It was now a mind game. Around the same time, the group split into two. The guides decided it was best to keep to a pace comfortable for each one of us. Sherapin was our lead. Paul and Mike stayed back to climb with Medha and Abhay. Sleepy and exhausted, I now focused on Sherapin’s feet and matched him step for step. Till daybreak….with that came more energy, the exhaustion vanished and we made a final effort over gravel. Celebration….. a dream come true. The feeling of winning, but at the same time humbled by the nature. We had not conquered the mountain, we had been welcomed by the peak. Stella Point is at 5756m (18885 ft). 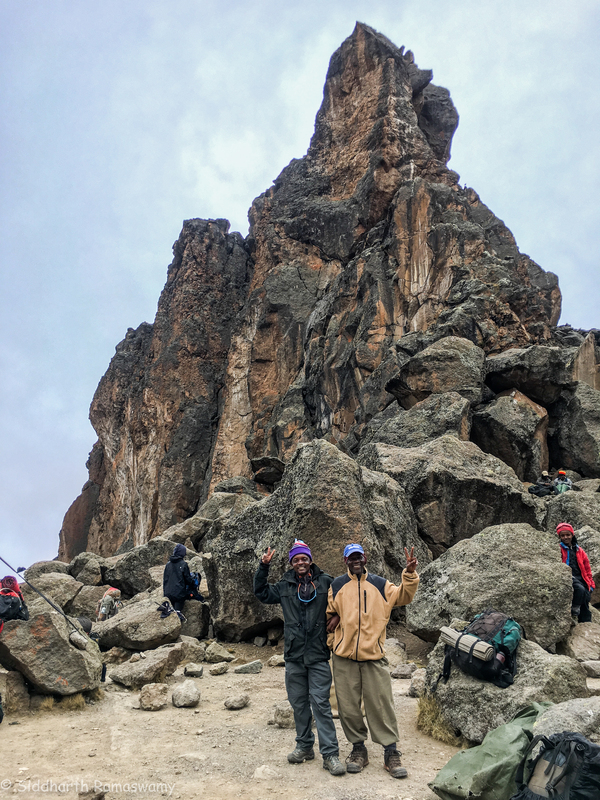 Uhuru peak is the highest point at 5895m (19341 ft). However, I must admit that the sense of achievement on reaching Stella point will remain dearer to me than when I summited the peak. After taking some photographs and started walking to the peak. This is a gradual incline on an even terrain along the rim of the crater. I expected to walk on ice and snow, but found myself walking on rocks and dust. The sight was beautiful and yet sad. The glaciers have retreated. Nature took millions of years to create and we humans are destroying it all in mere decades. This ecological disaster is clear proof of global warming accelerated by human indifference. 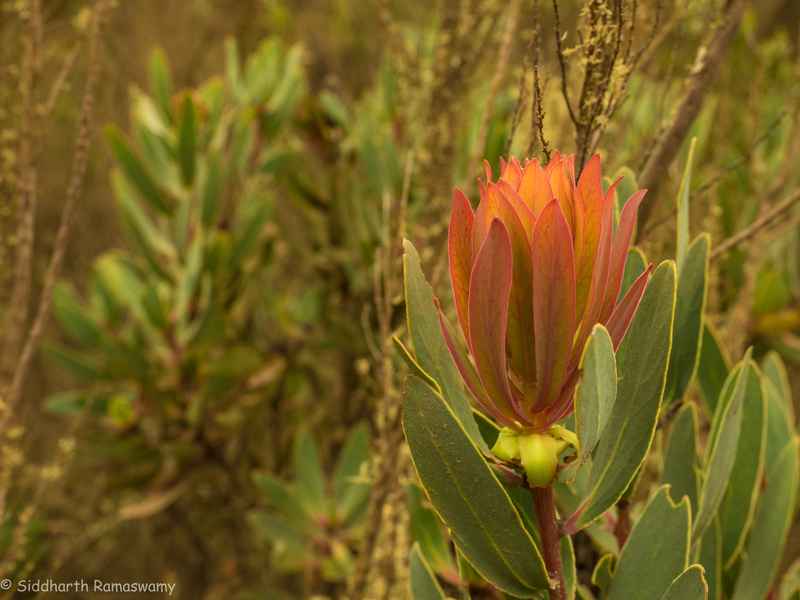 At the foot of the mountain, in Amboslei National park, the flora and fauna have depended for eons on the water from the glaciers for survival. They are now at a real risk of extermination. 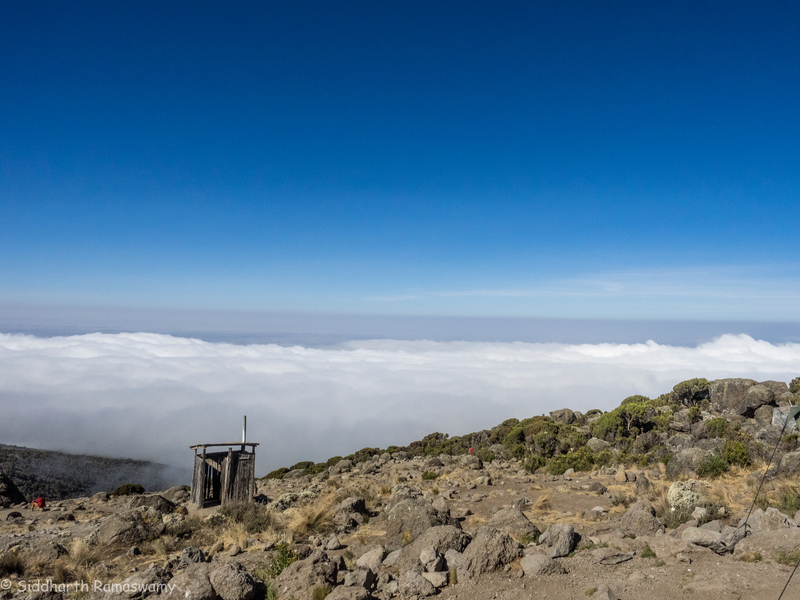 We reached Uhuru peak at 8:15 am. We had climbed onto the roof of Africa! Sherapin warned us that we could only stay a few minutes, given the altitude. We took our photographs and started our walk back to Stella Point. That is when we met Medha and Abhay, who were on their way up. 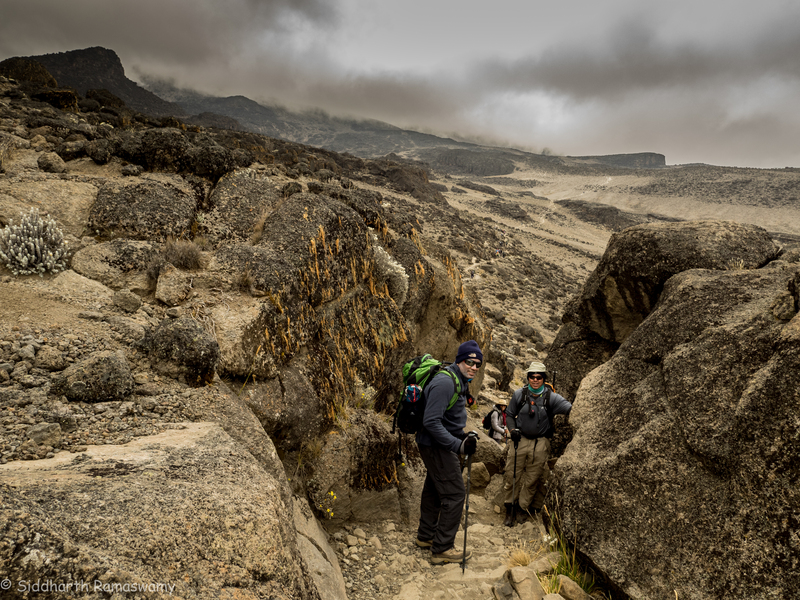 We slid down from Stella point to Barafu camp on scree – gravel and loose lava sand. On the way down we were met by our support team. “Congratulations”, they said. I was struck anew by the humility of these people. It was they who deserved the accolades. But for their help, encouragement, taking care of us and keeping our spirits high, we would never have managed this climb. We reached the camp at 1:00 pm. Exhausted, we fell asleep for an hour. A quick lunch at 2:00 pm and we set off again. The trek was through mist and light rain. We reached High camp(3950m) at 6:30 pm. Dinner was some chapatis, rice, vegetables and some spicy chips that Abhay and Medha had brought with them. It was a celebratory meal! 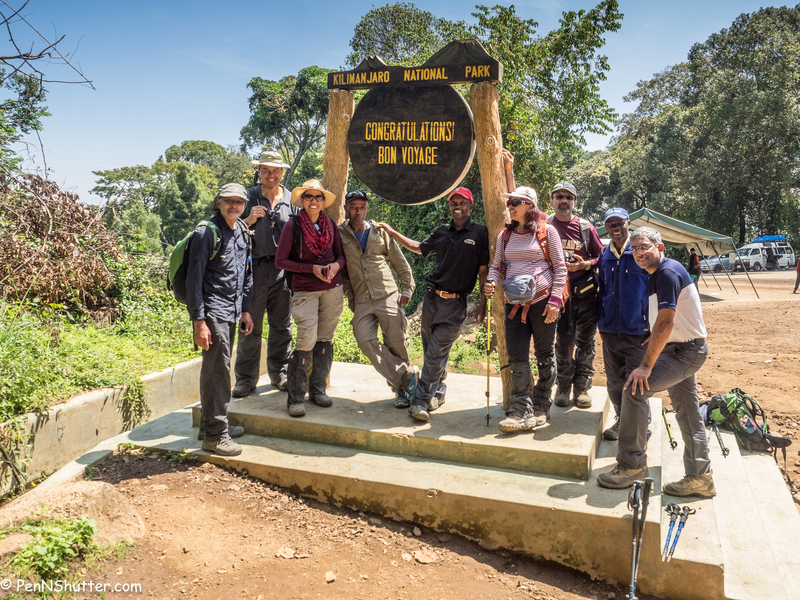 Day 8: High camp – Mweka gate. After a good night’s sleep we started our final climb down. 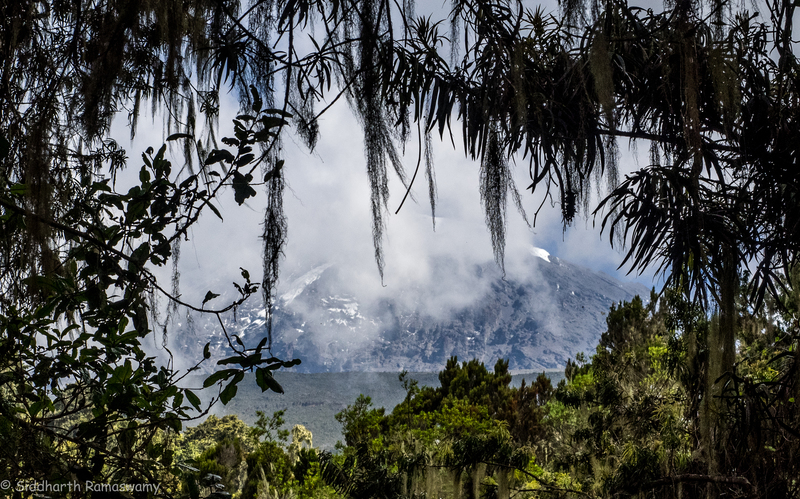 As we trekked we took a last look at the peak through the rain forest. We reached Mweka gate (1653m) at 2:00 pm. It had been two days since any of us had contacts our families. We finally got through. Back at the hotel, we had our first shower in 8 days. What a luxury! Yet, I had a sense of sadness at being back in civilisation. I missed the mountain. Kill is calling me again! Siddhu – you guys rock. Way to go. Thanks Shekar. I took the Olympus mirrorless, with the small lens. 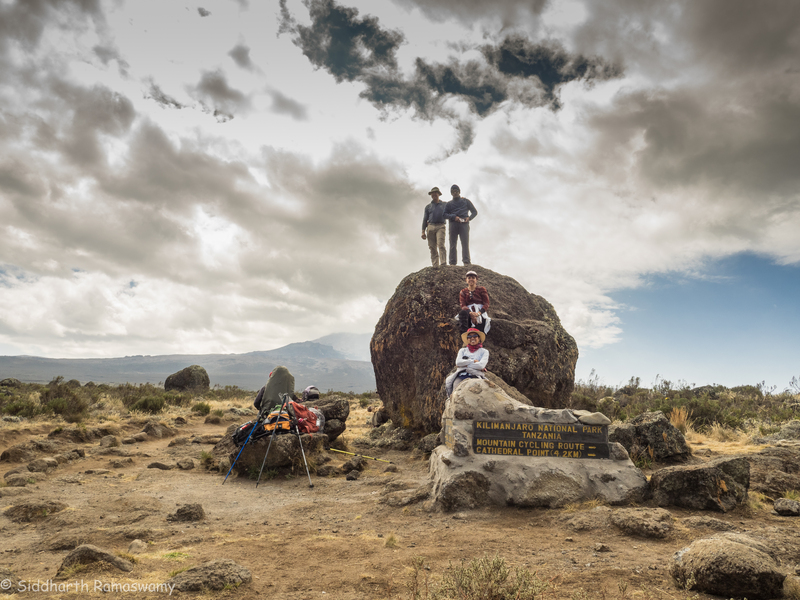 It’s a beautiful travelogue, vividly bringing to our eyes the scaling of Kilimanjaro. The photos are brilliant…shot well, capture the essence and captivate the readers. Kilimanjaro seems to be beckoning me now. I wish I were jumping up the rocks and measuring the heights. A wonderful travelogue Mr Siddharth. And due credits to your wonderful wife to be the strength behind your words and deeds. Awesome! Indeed an incredible experience and pushing the physical and mental limits. Photos are incredible as always. Assuming you didn’t haul your heavy gear up the mountain? 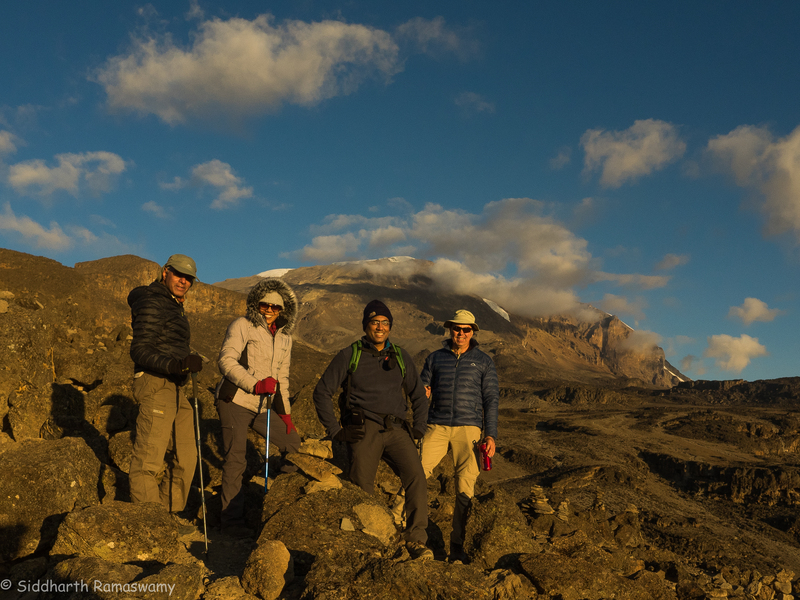 Thanks Siddharth for the excellent expose on the climb to the KILI. Appa read it out to me word by word and explained the excellent photos. 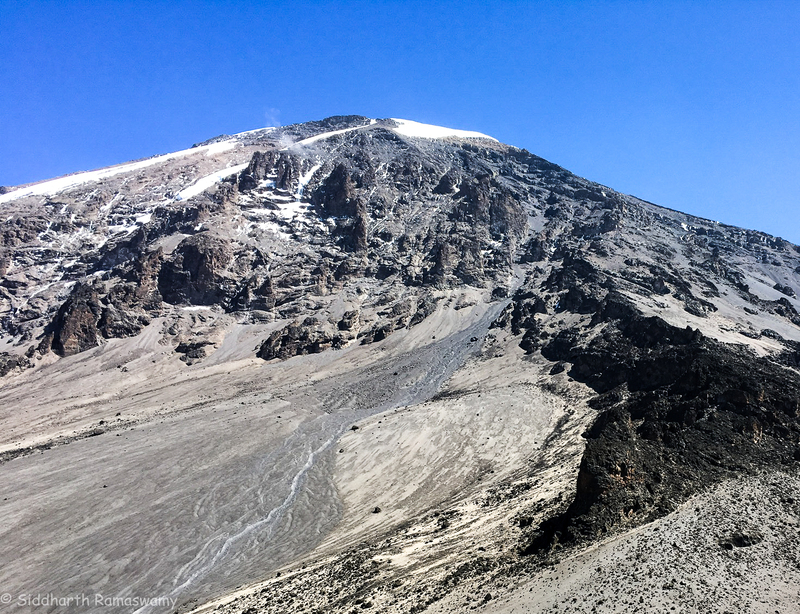 I felt I was climbing KILI myself. I can imagine you and your team feeling the sense of achievement of the life time. Hope you will achieve even higher “goals ” . I am sure Appa shares these views and join me in wishing you and Honey all the best in the coming years throughout your lives. We had snow all the way on summit night! 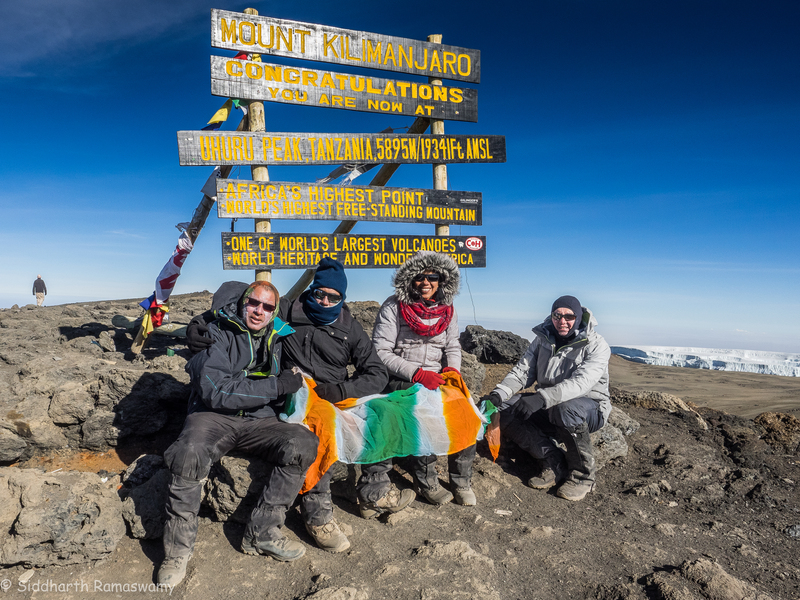 Incredible Siddharta and team Climb Kili!! The photodoc made me feel like i accompanied you all. 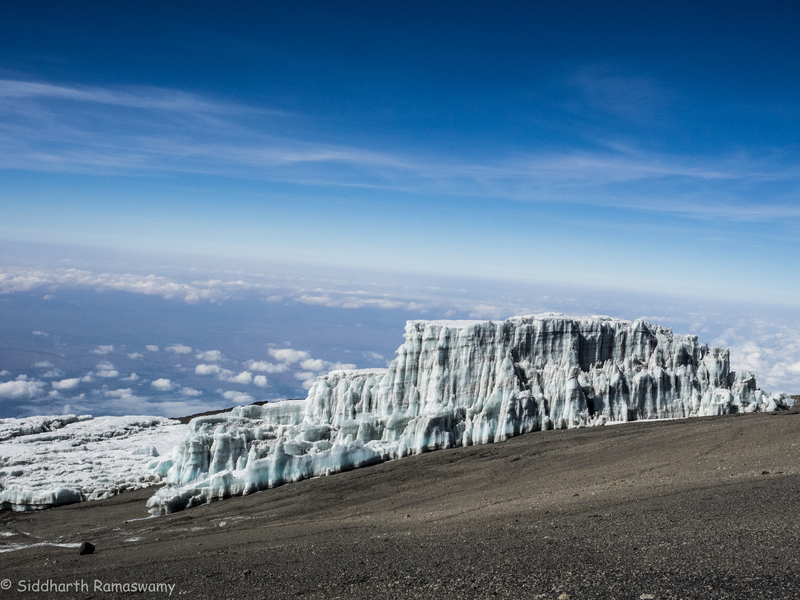 The absence of snows on Kilimanjaro is something we all use as `proof’ of global warming but your real experience of it and your words and images packed such an impact! Congratulations! Wow !!! Congratulations Sid !! This is an awesome feat ! It was really amazing to read about the entire trek written so beautifully . You took me to the Kilimanjaro as I was reading the entire piece ! The pics are awesome and just out of the world !! Am glad that enjoyed and had a safe trek ! Once again I congratulate you on this super feat !